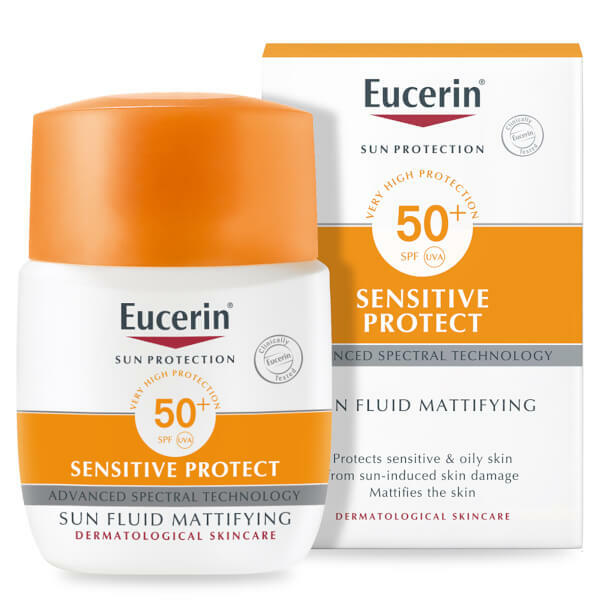 Protect your skin with Eucerin® Sun Protection Sun Fluid Mattifying Face SPF50+ Very High, a non-greasy, facial sunscreen that works to protect the skin, and its cells, from harmful UV rays whilst mattifying the complexion. 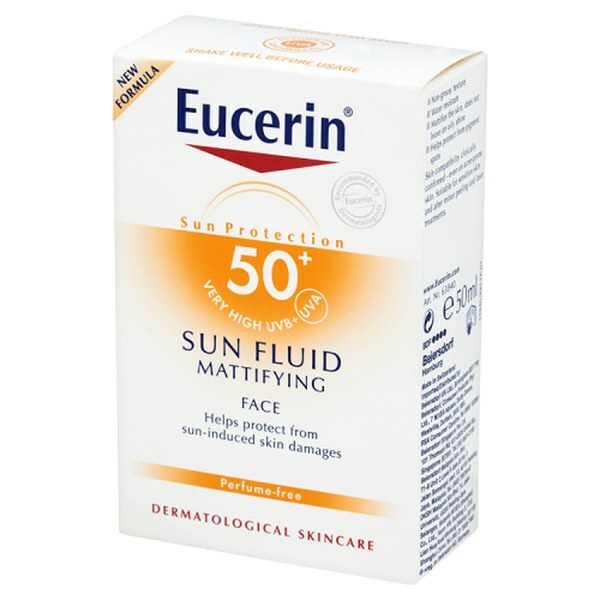 Extended exposure to sunlight can be seriously damaging; UVB rays penetrate the upper layer of skin to cause sunburn, and UVA rays penetrate deep down, causing sun allergies and premature ageing. To prevent this, the advanced formula combines multiple cutting-edge technologies, including liquorice extract and glycyrrhetinic acid to support the skin's own protection system and help protect skin cells from free radicals, sun-induced damage and premature ageing. Ultra-light, the sun lotion will expertly protect your skin and leave it looking fresh and matte. Perfect for humid climates. - K.N. 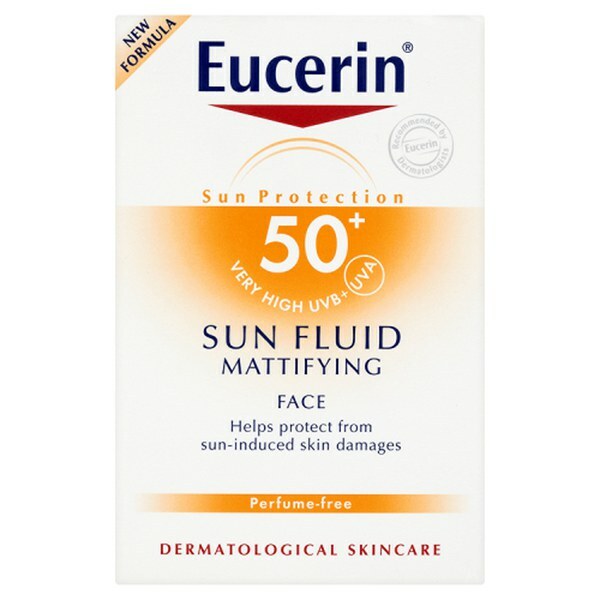 Ideal for normal to combination skin. Also suitable for blemish-prone skin. Fragrance-free. Non-comedogenic. Recommended by dermatologists. Water resistant. 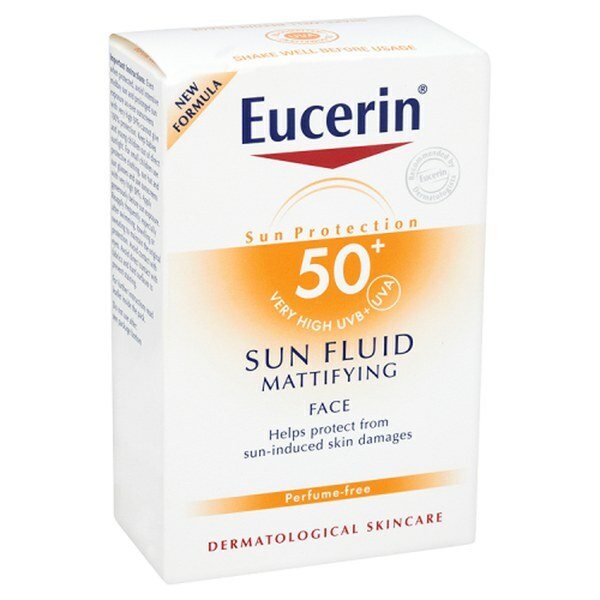 Apply generously before sun exposure and reapply frequently, especially after swimming, toweling and sweating to maintain the original protection. Insufficient quantity of sunscreen applied reduces the protection effect. Aqua, Isodecyl Neopentanoate, Butylene Glycol Dicaprylate/Dicaprate, Isopropyl Palmitate, Octocrylene, Alcohol Denat, Methyl Methacrylate Crosspolymer, Butyl Methoxydibenzoylmethane, Titanium Dioxide (nano), Bis-Ethylhexyloxyphenol Methoxyphenyl Triazine, Homosalate, Dibutyl Adipate, Glycine, Polyamide-5, Polymethylsilsesquioxane, Ethylhexyl Salicylate, Phenylbenzimidazole Sulfonic Acid, Arginine HCL, Polyglyceryl-4 Diisostearate Polyhydroxystearate Sebacate, Glycerin, Sodium Hyaluronate, Glycyrrhetinic Acid, Glycyrrhiza Inflata Root Extract, VP/Hexadecene Copolymer, Trimethoxycaprylylsilane, Trisodium EDTA, Silica Dimethyl Silylate, Dimethicone, Ethylhexylglycerin.